“Be doers of the word, and not hearers only, deceiving yourself.” James 1:22 NKJV. My Dad expected obedience. With him, obedience was the norm. If I did not respond accordingly, he would kindly ask if I heard him. He rightly assumed that if I heard him, obedience would be my response. My Dad never threatened me with, “Obey me or else.” My success was his highest hopes for my life. His love was generous and steadfast. His expectations were reasonable and clear. I regret the times my dad needed to ask, “Allen, did you hear me?” Sometimes, it seems I can still hear his voice when I need reminding that obedience is the best way forward. When there was an issue, the problem was never about my ability to hear; it was always about my willingness to obey. My Dad’s expectation was that if I were truly listening to him, I would hear him clearly and correctly, and I would respond obediently. And I would obey him promptly and completely. He was right to expect that, as is God. Attentive listening and prompt obedience are two things essential and invaluable for your success in life. Here are two practical realities. You must do more than just listen. You have to obey. If you do not do more than listen, you will not understand what God is saying? And if you don’t understand, how can you obey completely? The Bible says, “These blessings shall come on you . . if you will hearken to the voice of the Lord.” Read Deuteronomy 28:1-14 NKJ. Obedience releases unexpected blessings. 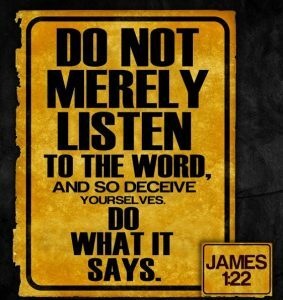 The New Testament seems to echo, “Be doers of the word, and not hearers only, deceiving yourself.” James 1:22 NKJ. Why do we entertain so many voices, as well as our own inner voice of ideas and opinions? Why would you and I allow meaningless noise to drown out the gentle and essential voice of the Holy Spirit? Why would we listen to voices which deceive, mislead, or distract? When God spoke to the young Samuel, his response was simple and honest, “Speak, Lord, Your servant is listening.” 1 Samuel 3:10. Samuel placed himself in the posture of a servant prepared to obey whatever God said. Should we do anything other than that? Samuel’s attention and recognition of God’s voice implies that he was listening in order to obey whatever God said. And God had a lot to tell him because the young Samuel was willing to listen when others did not. You would like to know your future, but you cannot apart from God. Life is lived one day at a time. Ever wonder what God is longing to tell you about what lies ahead? Would you breathe easier today, and worry less about tomorrow, if you knew that God has everything under His control? When you listen with a predisposition to obey, you will hear the truth-telling whisper of the Spirit in your heart assuring you that, “The Lord goes before you and will be with you . . do not be afraid.” Read Joshua 1:7-9 NIV. Live with a heart to know and obey God; doing so allows you to live with blessed assurance and complete confidence. My prayer for you today is that you will live confidently and obediently.